Whether you’re whiter than white or hovering on the line of the correct side of the law, everybody is fascinated with bank robberies, therefore it is no surprise that there are so many crime-themed slots which take inspiration from act with the Bank Cracker slot from Novomatic and the Break da Bank slot from Microgaming being prime examples. While bank robberies are certainly no joke, Blueprint Gaming lighten the mood with Cop the Lot to bring us a comical slot which boasts a cops and robbers theme that sees a musclebound police officer hot on the heels of four colourful, and despite their dopey appearances, very dangerous criminals in a battle of good versus bad. Once you load the Cop the Lot slot machine you will be presented with an adrenaline pumping animation which showcases all of the bonus features that you’ll find spinning the reels. With a bright blue background in the style of wire mesh, the soundtrack may sound familiar to those of you from an older generation as it’s that which was used in the ‘The Professionals’ TV series from the 1980’s. Played across 5 reels and 20 paylines, you can enjoy the battle of good versus bad from as little as 20p up to £300 per spin. As usual, Blueprint Gaming have gone all-out to create as much excitement for players as possible with three exciting bonus games included as well as providing you with the opportunity to get your mitts on the massive Gold Jackpot! It’s not a Blueprint Gaming slot without a variety of bonus features, and as usual, they haven’t disappointed. Smash ‘n’ Grab: Three or more bank vaults appearing on the reels at once will activate a free spins feature with you being transported to the banks most secure room filled with vaults where you are tasked with choosing from one of them. The vault will then open to reveal the number of free spins that you’ve been awarded (up to 50) with additional Wild and Bonus symbols added to the reels. Cops and Robbers: This feature begins once three or more of the police helmet symbols land on the reels at the same time and see you spin dice on a board game. You are tasked with rolling dice to see how far you can advance with the aim being to collect keys (collect three and you advance to the millionaire’s mansion for greater rewards) and multipliers as you move around the board, however you will have the cop hot on your heels and if he catches up with you, you’ll find yourself in court. The Usual Suspects: This copper is all too familiar with the bank robbers about town so when the job goes down, it’s no surprise that he rounds up the usual suspects and lines them up. All you must do is pick one of them to reveal a multiplier bonus worth up to 500x your stake! Usually we are content with just having the opportunity to win a jackpot, but Blueprint Gaming have been very generous and enabled us to scoop the Gold Jackpot in three different ways to boost our chances with the higher you bet seeing your odds increase even further. The jackpot can be won during the bonus games outlined above with the collection of three gold safes during the Cops and Robbers game seeing you hit gold, five gold safes in the free spins feature scooping the jackpot, while revealing a golden identity card during the Usual Suspects feature is the third and final method of claiming the jackpot! Criminals are always trying to outwit the cops and the cops are only too happy to show how chuffed they are when they catch them red-handed as they get to slap the handcuffs on them, and the Cop the Lot slot machine is no different as it showcases the cat and mouse nature of the cops and robbers theme. 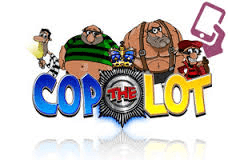 It may have quirky cartoon graphics and funny bonus games, but the prizes on offer (especially the opportunity to win the Gold Jackpot) on the Cop the Lot slot machine are certainly not to be laughed at!